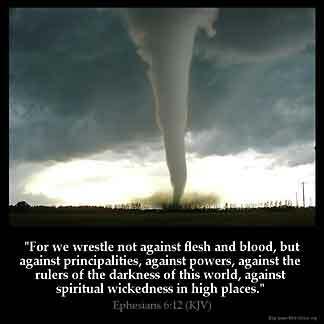 EPHESIANS 6:12 KJV "For we wrestle not against flesh and blood, but against principalities, against powers, against the rulers..."
For wee wrestle not against flesh and blood, but against principalities, against powers, against the rulers of the darknes of this world, against spirituall wickednes in high places. For our wrestling is not against flesh and blood, but against the principalities, against the powers, against the world-rulers of this darkness, against the spiritual `hosts' of wickedness in the heavenly `places'. For whi stryuyng is not to vs ayens fleisch and blood, but ayens princis and potestatis, ayens gouernours of the world of these derknessis, ayens spiritual thingis of wickidnesse, in heuenli thingis. 6:12 For our wrestling is not only, not chiefly, against flesh and blood - Weak men, or fleshly appetites. But against principalities, against powers - The mighty princes of all the infernal legions. And great is their power, and that likewise of those legions whom they command. Against the rulers of the world - Perhaps these principalities and powers remain mostly in the citadel of their kingdom of darkness. But there are other evil spirits who range abroad, to whom the provinces of the world are committed. Of the darkness - This is chiefly spiritual darkness. Of this age - Which prevails during the present state of things. Against wicked spirits - Who continually oppose faith, love, holiness, either by force or fraud; and labour to infuse unbelief, pride, idolatry malice, envy, anger, hatred. In heavenly places - Which were once their abode, and which they still aspire to, as far as they are permitted. Eph 6:12 For we wrestle. Fights then were a hand to hand grapple. Not against flesh and blood. While flesh and blood may seem to assail us, the real enemies are evil spiritual powers. Against principalities, against powers. These terms designate different rank of evil spirits. These were fallen angels (see Ro 8:38). The same terms are applied to the different ranks of holy angels in Eph 1:21. Against the rulers of the darkness of this world. Satan is described as the ruler of this world (Joh 12:31 14:30 16:11) and the god of this world (2Co 4:4). He uses for his dominion not only evil spirits, but wicked men, and his sway is darkness rather than light. Against spiritual wickedness in high [places]. "Spiritual [hosts] of wickedness" (Revised Version). It is likely that the meaning is the same as in Eph 2:2 The high places, the air, is a dwelling place and medium of these evil influences. At age nine while sitting in the pew at Bible School and asking for understanding on how to be 'saved', Christ manifested Himself to me in physical form none saw him but me and also manifested Satan to me. Satan was naked, covered in bumps, a foot tall - and was trying to hide himself beside the leg of the church pew. He tried to use his forearms to protect his eyes from what seemed to be a blinding light. And he trembled. At that time Christ spoke to me lips did not move but spoke from His mind and said, 'You need me to fight him for you.' Wow! Wow! Wow! I walked to the front, knelt at a pew, and the pastor said, 'Romans 10.9 That if thou shalt confess with they mouth the Lord Jesus and believe in thine heart that God hath raised him from the dead, thou shalt be saved.' Wow! AS I grew in grace and knowledge and as I began to study the Word, I clearly knew what happened that day. Satan was subjected to a blinding Light - the glory and brightness of the Son of God - Perfection. I knew clearly that only God has power over Satan. Father Son Holy Spirit is indeed my rock, shield, deliverer, fortress, and strength. I am in agreement with CDFROM 'S comment. This is the verse I am familiar with...NOT ONLY! Beware of false prophets - Many reside in high places on this earth. Need I mention Hitler? Who would starve, kill and maim for personal glory, power, and wealth in our world today? this describes to us the darkness America is facing we are being tested or judged as our father has allowed but there still is no temptation that can overcome us when we are in the spirt walking with God thanks be onto God which always gives us the victory - it 's not for us to say why it 's for us to say why not me us. The best reason given in Scripture against hating our enemy, for this powerful enemy is far more evil than any mere human could be and truly mere men can be saved out of its power through prayer and faith in Jesus Christ. A comforting Word from God. He knows what we must endure in the last days. He will be us. God will not give the evil doers upper hands over us!